I don’t know how I managed the luxury of shopping at Sephora and department stores exclusively for beauty products while in college, but I do know times are a-changin’. So, I had a new mission in mind: sheer, natural coverage + easy on the wallet. I stumbled upon Rimmel’s line and remembered I had read somewhere that the texture and sheer coverage of Rimmel‘s new Stay Matte Foundation was closer to that of a tinted moisturizer. With a friendly price ($6), I thought, why not? Luckily, I found a color that matched my skin (half the battle is won there). The formula was surprisingly smooth and light, and went on with a natural finish (I used a foundation brush, but fingers work just as well). It really did feel like a moisturizer, and a little went a long way. 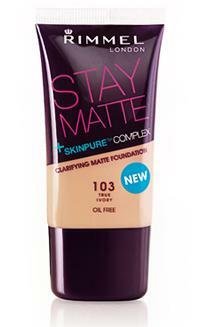 It does tend to stay matte for more than 8 hours and with a mattifying base under, it’s shine-free for the whole day. Coverage is natural — looks like my skin, but better. For $6, this is an amazing bargain. I was really surprised by how well this worked and how great it looks — it works just as well if not better than dept. store brands. I’m pretty happy with this find for now. Just make sure to test a little on your wrist or jawline to find the closest color match.